My friend and I talked today. Her heart was heavy with burden over a loved one who has been lamenting past sins. The sins are quite old, and minor on a human scale, but the woman feels pain afresh. So, we talked of God’s precious grace and how my friend can remind this woman of the loving grace of The Father who forgives and casts our sin far away. We’re praying for the Lord to soften her heart and open her eyes to see His loving, forgiving, and gracious nature. And then I remembered… we all need to be reminded of this at times. Past sin can occasionally resurface. Sometimes, it’s just a simple memory than can be let go with a, “Thank you God for getting me through that mess!”, or a “Thanks to Jesus, now I know better!”. 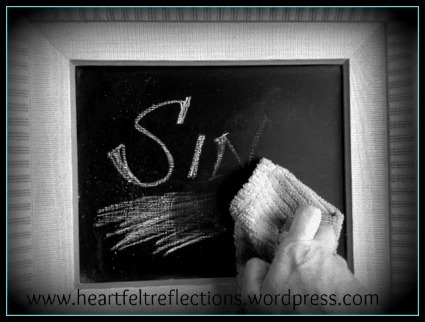 But when past, confessed, repented of sin rears its ugly head to hang over you and make you wallow in guilt or shame, that’s not the Holy Spirit convicting you… That’s good old fashioned condemnation, either from the flesh or from Satan. Either way, it needs to be chased away with truth and love! Don’t let it sit and take root. We must take our thoughts captive and evaluate them– keep the holy and evict the unholy! God casts our sin away from us, and blots out our every stain because of amazing, sweet Grace. We don’t deserve any of this forgiveness– we can’t earn it or work to pay it off. It’s freely given from a loving God, purchased by a passionate Savior. It is undeserved love and favor. Do you know this old hymn? I think sometimes we earthly, fleshly humans can get grace a little twisted. (Or a lot twisted!) At times, we might think that if we feel deeply guilty it means we are more repentant. Or if we’re so sorry we can’t move forward then somehow we’ve paid a little for what we’ve done, thereby earning the grace. But, that’s not how it works. A truly repentant heart needs to learn to be thankful, every moment of every day, for God’s grace… and move on with life – not forgetting the grace God’s afforded, but also not living with one foot in yesterday and one in today. God has new mercies every day for us, and spiritual blessings galore awaiting us, but we could miss them if we overly focus on the past. We must press on and continue running the race that God has for us, laying aside the sins that have entangled us. How has God reminded you lately to live in light of His grace? How has His undeserved, unconditional love changed your life? This is such good news for many of us. It’s hard to realize that all of our sins – not just some – are completely wiped away, no matter how dark or dirty they were. I can remember telling a preacher that “I’m not qualified to be Deacon”, and he answered saying “None of us are.” Then I said “I’ve done terrible things in my life” and he said “Did you ever intentionally kill Christians, just because they were Christians? Paul did…and God gave him Grace.” I became a Deacon. Yes, completely wiped away. Completely. His grace is so rich and so absolutely undeserved. Absolutely amazing how much He loves us! Blessings in Christ! BTW, love that story! Thanks for sharing! Thank you, Ali! I don’t think we can hear enough about grace, because we are always being reminded of our sin, one way or another. I pray to say NO to the condemnation each time it starts and YES to His love, mercy and grace! God bless you! Amen! I’ll be doing the same right along with you Debbie! God bless you, too! !